I love pancakes, I really do. However, for breakfast, I’m usually an egg person. I feel like the protein from the eggs keeps me going longer. But there are those days when eggs won’t do and something sweet is the only option that will satisfy. Having a pancake recipe available that is healthy is also a must. I can’t always eat pancakes that are over the top. I like to make these and freeze them, pulling them out a couple at a time. They are truly low-cal, which allows for a dousing of butter and syrup if the urge hits. The kids will eat them too and won’t be the wiser to the healthy food they are taking in…sometimes it’s better that way. This is a great post-workout breakfast as well. Add egg whites, rolled oats, cottage cheese, sugar, cinnamon and vanilla to a food processor or a blender. Blend until smooth scraping, down the bowl at least once. Heat a griddle or skillet over med-low heat and spray with non-stick cooking spray. For each pancake, pour a 1/4 cup of batter onto the griddle. Drop 8-10 blueberries on each pancake as they begin to cook. Flip pancakes when they start to bubble. Cook until golden brown. Dust with confectioners’ sugar or drizzle with syrup if desired. The perfect way to get your day started! I love that pretty blue glass plate! That’s gorgeous. These sound lovely! 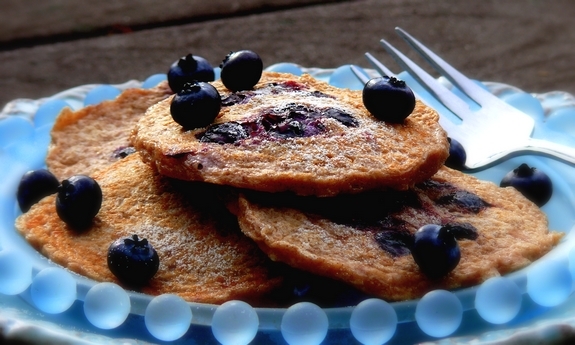 Blueberry pancakes are my boy’s favorite breakfast, but I would love to change it up by adding some oatmeal! Yum! OMG perfect for my DIET!!!! I am more of an egg person, too. However, I am intrigued by the texture and low-fat/low-cal pedigree of these pancakes (can I say “pedigree” when talking about pancakes?) Seriously, they look really good. Whoa. I just made these and they are superb! These would be amazing even if you don’t have blueberries on hand. what a unique pancake I’ve ever seen. I will try this at home. 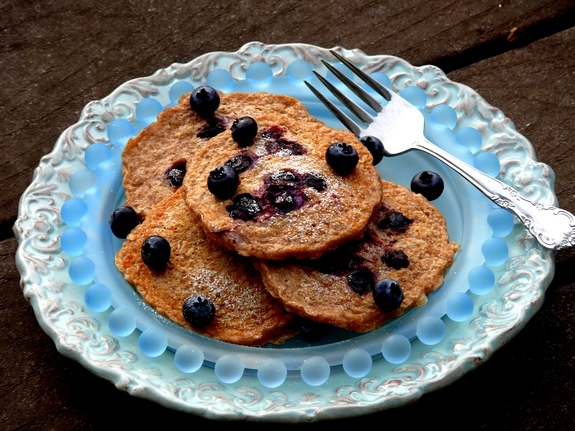 You know I to eat pancakes every morning.. nice recipe! i’m usually an egg person and found this recipe when i had some leftover egg whites and didn’t want to eat oatmeal either. 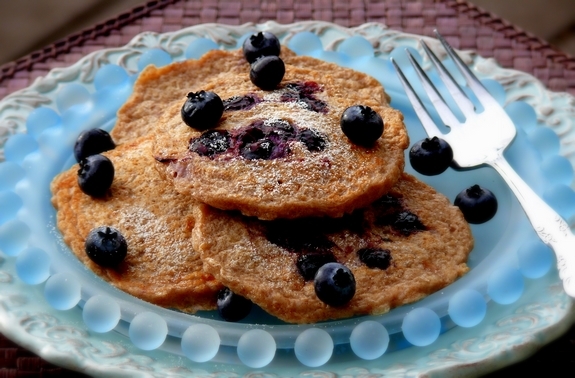 i ended up modifying this recipe as i only used the egg whites, oats and cinnamon with blueberries and didn’t blend them but just whisked as i wanted to keep the texture (next time would love to add the vanilla). i topped it off with drizzled fresh honey instead of syrup. surprisingly filling, delicious, *feeling* healthy!, and a creative alternative to the everyday eggs or oatmeal mix. Thanks!